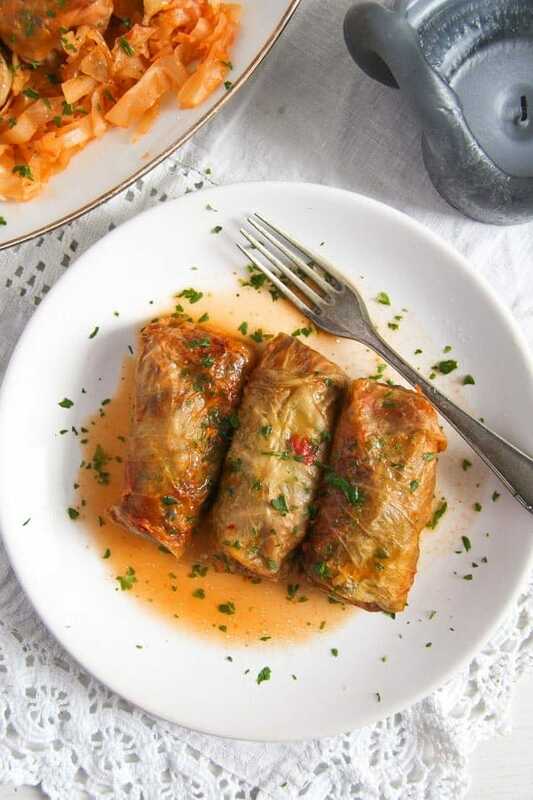 Delicious and comforting sweet-and-sour recipe for vegan cabbage rolls made with sauerkraut/fermented cabbage and filled with rice, walnuts and raisins. 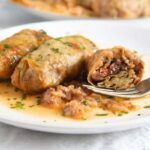 Sweet-and-sour, comforting delight, I love these Vegan Sauerkraut Rolls with Rice, Walnuts and Raisins so much. Not only warm, but after we had lunch the day I made them, I kept taking the lid off the pot every now and then and put a cold roll into my mouth. So good, you really can’t stop eating them. 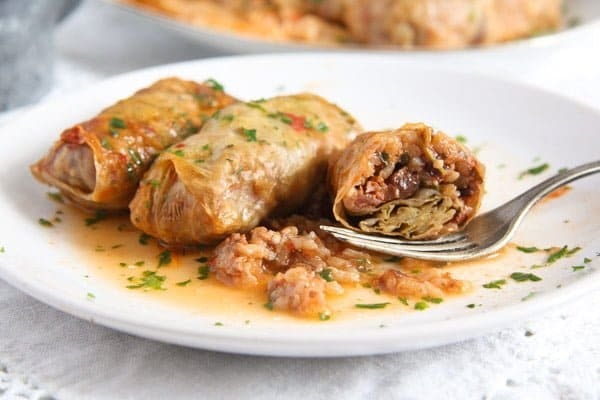 These Vegan Sauerkraut Rolls with Rice, Walnuts and Raisins are a typical Romanian fasting time recipe. 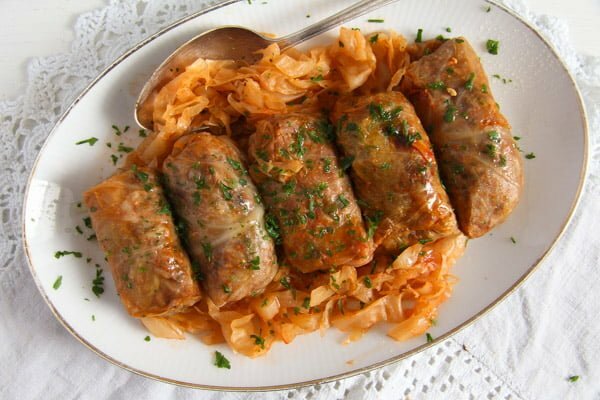 The traditional and best Romanian cabbage rolls – Sarmale are made with pork and rice and lots of spices, but many Romanian people are very religious and respect the Orthodox fasting time tradition, which won’t allow the consumption of meat or any animal products for quite lengthy periods of time in the year. Some of my favorites fasting times recipes, dishes that I keep cooking on repeat, although I am not actually ever seriously fasting are this Vegan and Healthy Tomato Rice with Zucchini and Carrots, this other rice dish – the Romanian Vegan Vegetable Rice or Pilaf or this Vegan Soy Granules Vegetable Stew with Wine. 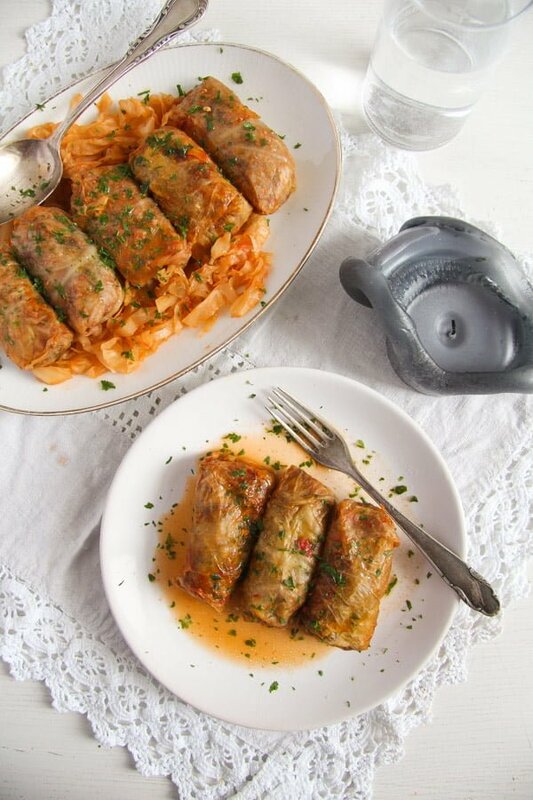 In the previous post Vegan Cabbage Rolls Stuffed with Amaranth and Sweet Potatoes I took more time to explain the way of working with sauerkraut or fermented cabbage. 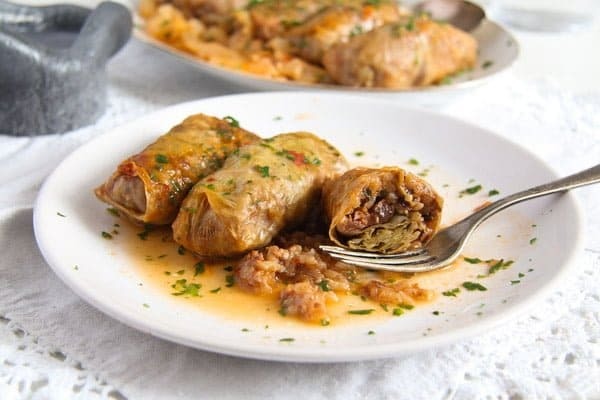 However, if you are unable to buy whole heads of fermented cabbage where you live, these Vegan Sauerkraut Rolls with Rice, Walnuts and Raisins and the amaranth cabbage rolls mentioned above can be made with fresh cabbage as well. When using a whole head of fresh cabbage you will have to soften the leaves before forming the rolls. To do that you start by removing the core of the cabbage. First cut away the protruding part of the core. Then make incisions with a small sharp knife around the core, about 4-6 incisions around the core. Try to loosen the core by cutting through it from one incision to the other, like making lots of X signs. When the core is loose enough start removing it piece by piece cutting here and there to make it looser. Fill a large pot with hot water. When the water boils add about 1 tablespoon of salt and a good splash of white wine vinegar. Carefully place the cabbage into the water, first with the hole facing down. Cook it for about 10-15 minutes, then turn it in and start removing the leaves. You will do that with the help of two forks, scratching and pulling at the edges of the hole. If they don’t come off easily continue cooking the cabbage until they start to come off. Be careful not to scald your hands with the boiling water. You will only be able to remove one or two layers of leaves at a time, so patience is required. Keep turning the cabbage in the pot from time to time. After removing some leaves, leave them to drain and cool down in a large colander and continue cooking the rest of the cabbage until you are able to remove all the leaves. The leaves should be really pliable. The filling for the Vegan Sauerkraut Rolls with Rice, Walnuts and Raisins is very easy to make. 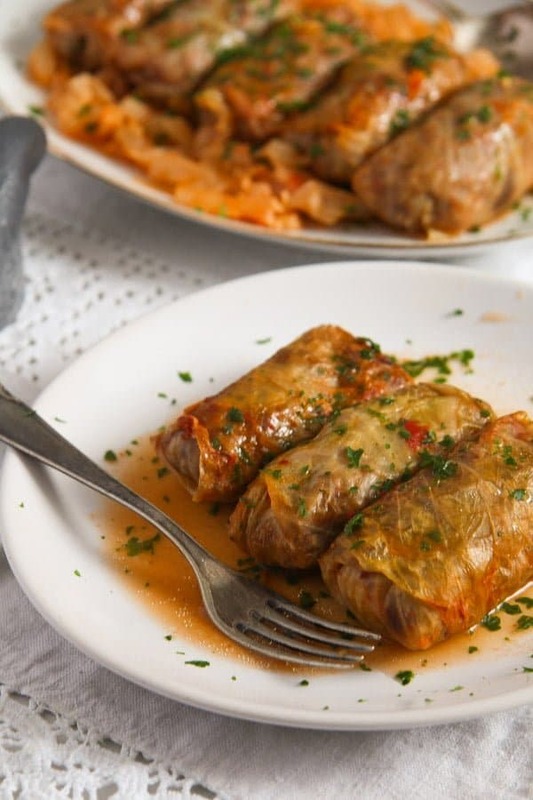 I recommend using round grain rice when making cabbage rolls, I have tried them with long grain rice as well, but I think that the round grain rice is much more suitable, it is softer and more comforting when cooked in a roll. If there is too much leftover sauerkraut after making the rolls, you don’t have to use it all for this dish. Place it in a plastic container or jar and keep it the fridge. You can use it to make a soup or a sauerkraut stew for instance, during the following week. In the meantime prepare the filling. Place the raisins in a bowl, cover with warm water and let soak while you prepare the rest. Wash and drain the rice. Chop the onion finely. Heat the oil in a pan and cook the onion for about 2 minutes. Add the rice and cook stirring often for about 3 minutes until the rice is shiny and all coated in oil. Take off the heat. Drain and chop the raisins and give them to the rice. Add the ground walnuts, 1 tablespoon of the tomato paste, parsley and salt and pepper to taste. Fill the sauerkraut rolls. Drain and rinse the cabbage leaves. Place them on a chopping board, one at a time, and remove the lower part of the leaf, where the stem is very thick. Cut the larger leaves into halves, in the middle where the thick stem is. Discard the thick stem but only in the case of the larger leaves that you split in half. Leave the smaller leaves whole, but cut the thick stem as good as possible so that the leaves will be easy to roll. To make the rolls, drain the cabbage leaves well. Place one on the working surface, place a little filling more or less in the middle of the leaf. Fold the lower part of the leaf over, then one side of the leaf over the filling, then the other side of the leaf over. Roll the leaf to form the cabbage roll and tuck in the open end of the leaf. If some of the leaves are too small you can build a cabbage roll from two leaves, nicely arranged on top of each other. Chop the middle of the cabbage (where the leaves are too small to use) and all leftover pieces of cabbage into fine stripes. Place a layer of chopped cabbage on the bottom of a heavy bottom pot or Dutch oven. Add 2 bay leaves, the thyme or savory and the dill seed, if you have them. Arrange the sauerkraut rolls on top of the chopped cabbage. Add the remaining bay leaves and some more thyme/savory and dill seeds. Top with another layer of chopped cabbage. 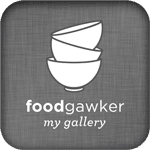 In a small pot whisk together the remaining tablespoon of tomato paste and enough hot water to hold the sauerkraut rolls. Carefully pour the tomato water into the pot. Add more hot water, if you don't have enough from the beginning, the rolls should be almost covered with water. Cover the pot, bring to a boil, turn the heat down to low and simmer for one hour. Shortly before the hour is up, preheat the oven to 180 degrees Celsius/ 360 degrees Fahrenheit. Remove the lid from the pot and place the uncovered pot into the hot oven. Bake for 40 – 50 minutes until the rolls are nicely colored and really soft inside. You can use fresh cabbage as well. Read the blog post for instructions on preparing the fresh cabbage leaves for stuffing.If there is too much leftover sauerkraut, you don't have to use it all for this dish. Place it in a plastic container or jar and keep it the fridge. You can use it to make a soup, for instance, during the following week. OMG! I wish I could taste this! I love sauerkraut and just talked about it to my husband that I haven’t had it for a while. It’s not common in our cuisine, but I got hooked when I made pig knuckles and ate them with sauerkraut few years ago!!!! I love this! These rolls remind me of spring rolls, I can’t wait to make them at home! Sauerkraut is not usually a common ingredient i’d imagine using, but definitely going to try making these!